Chalet Alice Velut is our new addition for winter 2017/18. We are very excited to announce that we have taken on additional chalet apartments for our clients to rent from the 2017/18 winter season – Chalet Alice Velut in St Martin de Belleville. Nestled behind the church, in the heart centre of Saint Martin de Belleville you will find ‘Chalet Alice Velut’. A beautiful and traditional chalet building that houses 5 self-contained charming chalet apartments! From the front door you can walk to the drag lift and closest ski slopes in less than 2 minutes. It’s a great central location! All necessary resort facilities such as the supermarket, tourist office, rental shops and a fantastic bakery are situated on your doorstep! The apartments sleep between 4 and 9 people and are perfect for small families as well as larger groups that would like to rent more than one apartment. All of the chalet apartments have well-equipped kitchens, an open-plan living and dining area, real log fires and access onto private balconies. The apartments Azalée, Iris and Marguerite have been renovated this summer. Brand new bathrooms, modernised kitchens and updated furniture. Find out more about the renovation by clicking here. We are very excited to have added such lovely chalets to our portfolio and are confident that all of our guests will have a lovely holiday with us in the ‘Chalet Alice Velut apartments’. 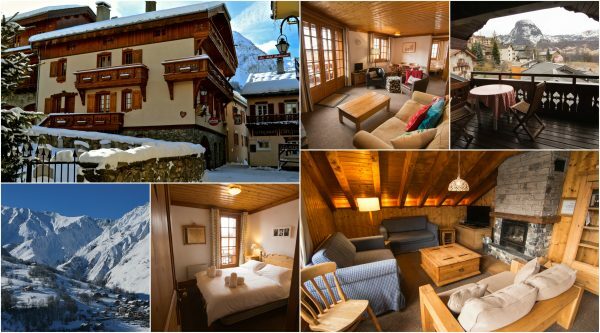 Three Valley ski apartments – Situated in the centre of St Martin de Belleville. Get in touch now to secure your ski holiday next winter season!